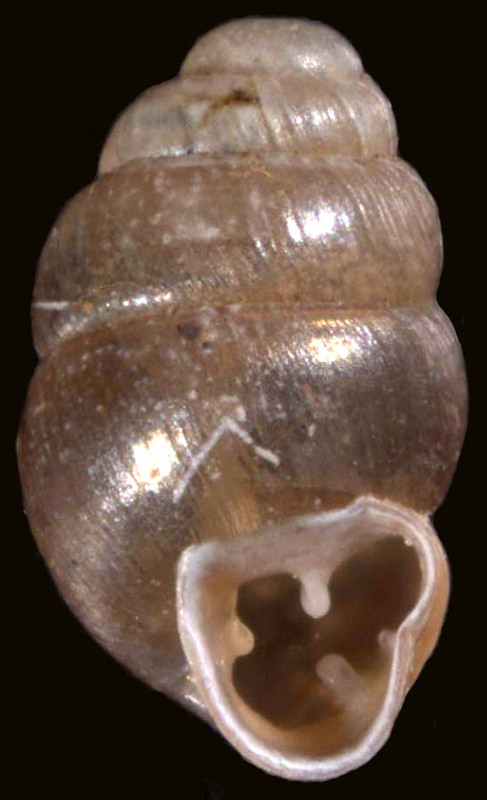 Vertigo tridentata, more commonly known as Honey Vertigo, is a small, terrestrial snail native to Wisconsin. It has a spiral shell with about five "whorls" when fully grown and on average the adult measures 2 millimeters long and 1 millimeter wide. Their shell has a slight shine or gloss to it and has an unmistakable honey-yellow to a tan or light brown coloration (Pilsbry, 1948). Vertigo tridentata spend their life on the ground or low to the ground on the base of trees and weeds in a sunny, yet moist and humid environment and are usually located close to a source of water such as a marsh or lake so they do not risk drying out (Harms, 2008). Continue exploring this site to find out all the information you need to know about Vertigo tridentata and what better to begin than to learn their taxonomy or Classification within the phylogeny tree. To continue learning more about other native land snails, visit: Wisconsin Land Snails, and to view other websites designed by students in the Biology program at the University of Wisconsin-La Crosse, visit: Multiple Organisms.